In the living brain, millions of nerve cells communicate with each other by emitting tiny electrical impulses. In this way, the brain is electrically active night and day throughout ones life. This activity can be registered as oscillations (popularly called brain waves) by placing electrodes on the scalp, amplifying the signals and displaying them on a computer monitor. This method of measuring is called electroencephalo-graphy (EEG). The brain oscillates at different rates (frequency) depending on the state of consciousness, just as the height of the waves (amplitude) can vary. There is a direct correlation between a persons activity or level of attention and his brain wave frequency (see fig. 1). During unconscious states (e.g. deep sleep) the slow delta waves with high amplitudes appear in the EEG. In the half conscious state, between wakefulness and sleep, theta waves are often dominant, and during the wakeful, mentally relaxed state with closed eyes, alpha waves dominate in most people. Finally, the high frequency beta waves with small amplitude appear during conscious wakeful activity. Thus, the EEG measurements can verify whether a person is conscious (alpha and beta waves) or unconscious (delta and theta waves). The lower the EEG frequency, the more unconscious the state (fig. 1). Beta waves (13-36 oscillations (or waves) per second (Hz)). This is the brain rhythm in the normal wakeful state associated with thinking, problem solving and active attention directed towards the outer world. 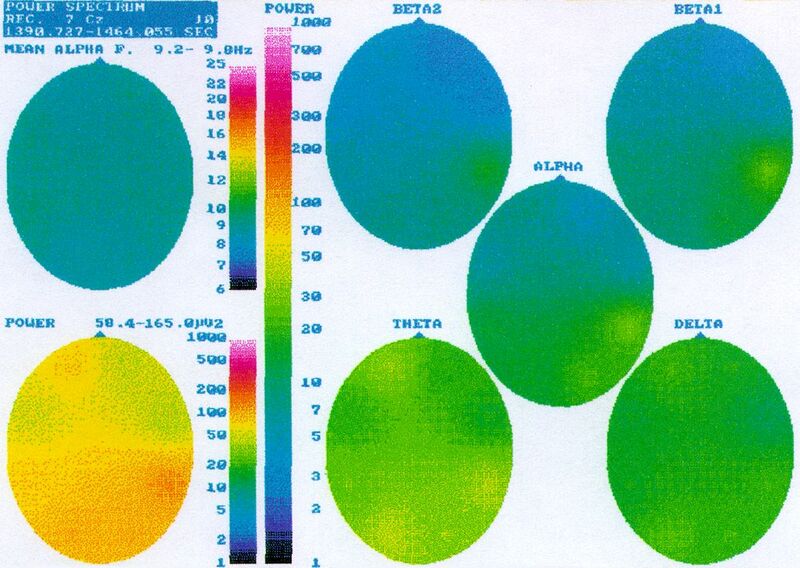 Beta waves may be classified as beta 1 (13-20 Hz) and beta 2 (20-36 Hz). Mental tensions, excitement and anxiety can increase both amplitude and frequency of the beta rhythms. This can cause a shift from beta1 to beta2. Alpha waves (8-13 Hz). Alpha is the most dominant of all brain rhythms. Most people have some alpha activity in their EEG, especially when they close their eyes, turn the attention inwards and relax. This increases the amplitude of the alpha waves. Alpha waves, which signify conscious awareness, are the “bridge” or “entrance ticket” to the unconscious, which is represented by even lower frequencies (theta and delta). Theta waves (4-8 Hz). Theta is the dominant brain rhythm of small children. In adults, theta waves normally appear only during dreaming or drowsiness, as well as during strong emotions. Theta waves are formed deep in the brain and reflect unconscious activity associated with emotions and dreams. Both when one comes close to unconscious memories during deep meditation and close to repressed feelings in therapy, the theta activity tends to increase. In order to have conscious access to and remembrance of the unconscious content, alpha waves must be present in the EEG. Without alpha, the unconscious content remains unconscious. The presence of a certain amount of theta combined with alpha in the EEG recorded during rest may signify personal insight and creativity. Delta waves (0,5-4 Hz). Delta is seen in new born babies and in adults during deep sleep. These slow rhythms are associated with basic survival functions deeply seated in the brain. During psychotherapy, where patients relive their own birth, the appearance of delta waves has been observed. Delta waves are associated with the deepest states of consciousness. Some consider that delta signifies contact with the collective unconscious. Delta rhythms combined with alpha can reflect an inner intuitive, empathetic radar, a kind of sixth sense. The meditative state builds a bridge between the conscious and unconscious. It is a drowsy/dreamy state observed by a clear, conscious awareness. The EEG pattern is a mixture of alpha and theta waves. Theta signifies subconscious activity, while alpha reflects the conscious awareness. We wanted to study the effects of Kriya Yoga on the brains activity (EEG). In scientific literature there are often reports of an increase in alpha and theta waves during and after various forms of meditation. The ancient Tantric Kriya Yoga is a powerful method for awakening and expanding consciousness, as well as for strengthening the vital and psychic energy. We therefore anticipated that the EEG measurements before and after a single Kriya Yoga session would show significant changes. Furthermore, we wanted to chart the brains activity on coloured brain maps (see fig. 4 and 5) during the distinct changes in consciousness that occur in connection with Kriya Yoga. Position of the electrodes on the head during recording. Yoga teachers from the Scandinavian Yoga and Meditation School – all with many years experience of Kriya Yoga – participated in the research. EEG measurements were taken immediately before and after two hours of Kriya Yoga from eight electrodes, four over the left side of the brain and four over the right, placed on the scalp with the aid of elastic bands. The amplified EEG signals were transmitted to a computer, displayed on a screen and simultaneously stored on a hard disk. 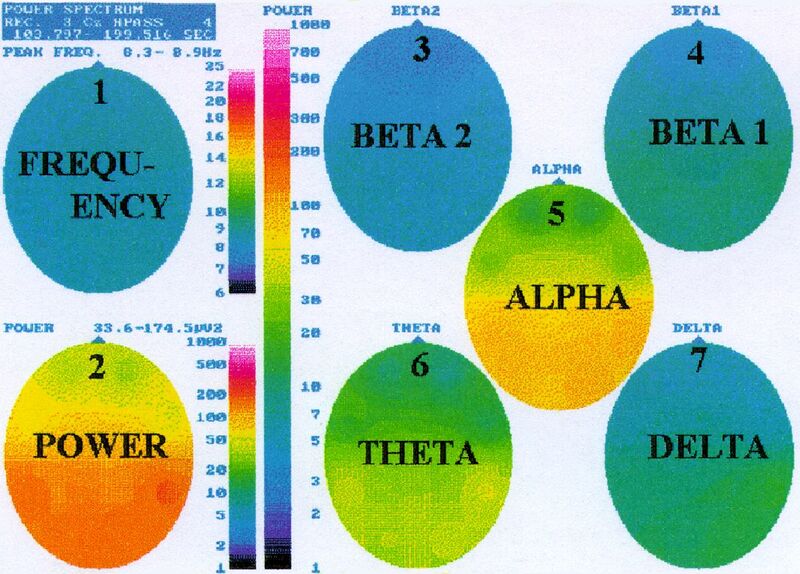 Subsequently, the EEG data was analysed for distribution of delta, theta, alpha and beta rhythms in the EEG. Following the meditation, a significant rise of alpha and theta rhythms in the brain was observed in ten out of eleven subjects. For some, the alpha waves more than doubled. The increase of these rhythms was greatest in the rear part of the brain (parietal regions), where both alpha and theta rhythms rose by an average of 40% (see fig. 2). There was a general tendency for these rhythms to spread from the rear part of the brain forwards. In ten of the eleven right handed people, the alpha increased more in the right than in the left side of the temporal regions (fig. 3). The significance of these changes will be discussed below. All the above mentioned results are statistically significant and therefore cannot be ascribed to coincidence. With mentally healthy human beings, an ideal R/L ratio is 1,05 – 1,10- a little higher (culturally determined?) activity in the left compared to the right side. During deep relaxation, though, human beings come nearer to a balance of 1,00 between the brain halves. On the other hand, with neurotic and psychiatric patients, a R/L ratio far below 1,00 is found. The greater the mental disturbance, the lower the ratio: People suffering from anxiety neurosis, for instance, show values from 0,93 to extremely low values of 0,50 to 0,60 where you find schizophrenic paranoiacs (Hoffmann,1982). The considerable increase in alpha and theta activity in most regions of the brain after meditation (fig. 4) indicates that the brain is deeply relaxed and focused following Kriya Yoga. It also shows that, through the meditation, the subjects have obtained a better contact with their subconscious and their emotions. The great increase of alpha in the right temporal lobe is an interesting finding. Recent research in the US has shown that depressed, introvert people have more alpha in the left fronto-temporal region, while optimistic, extrovert people have more alpha in the right side. According to the research, an increase of alpha in the right side, as found in this study of Kriya Yoga, counteracts stress and depression. Several scientific studies have demonstrated that theta rhythms in the EEG (mixed with alpha) correlate with the appearance of previously unconscious feelings, images and memories. Brain researchers claim that a person in the high alpha/theta state is able to confront and integrate unconscious processes. This knowledge from modern research supports the experience that yogis have had from Kriya Yoga over thousands of years, that the meditative state, characterised by high alpha/theta activity, can bring about a release or “cleansing” of unconscious material in a person. This study demonstrates that Kriya Yoga is an extremely effective technique for raising the alpha/theta activity in the EEG and therefore it also strengthens the associated positive effects. After two hours of practising Kriya Yoga, both the alpha and theta activity has risen considerably. This shows that the subject is more relaxed after the meditation and in better contact with his/her feelings and his/her subconscious. These brain maps are made on the basis of approximately 60 seconds recording of the brain waves from eight EEG channels during rest. Four electrodes are placed on the left side, four on the right side (and a reference electrode on the top of the head) (see fig. 2.). 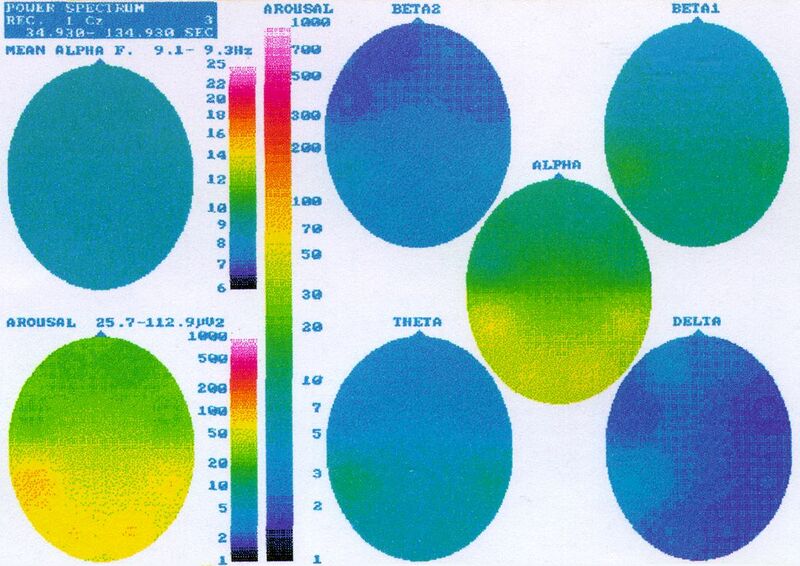 A brain map is constructed on the basis of a frequency analyser which shows the distribution in the brain of delta, theta, alpha and beta waves. As shown in fig.5, a brain map is made up of seven oval pictures, which, with various colours, indicate the distribution in the brain of a specific EEG parameter. These pictures depict the brain as seen from above, where the small tip is the position of the nose. 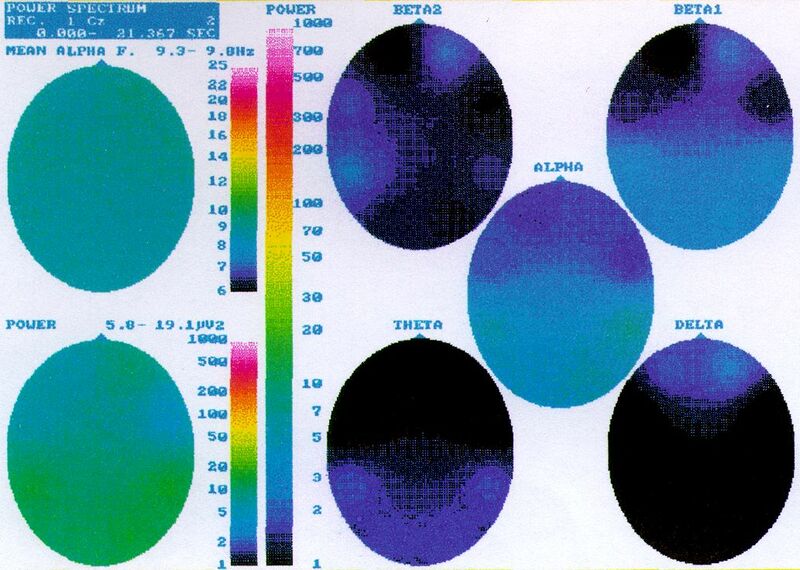 Most interesting are the five pictures to the right, which show the distribution of delta, theta, alpha, beta-1 and beta-2 waves. The individual pictures show, in accordance with the tall vertical colour scale, the brain waves of the mean amplitude beneath each of the eight electrodes. Thus, the dark blue colour indicates a very small amplitude, while the red and white colours indicate maximum amplitude. 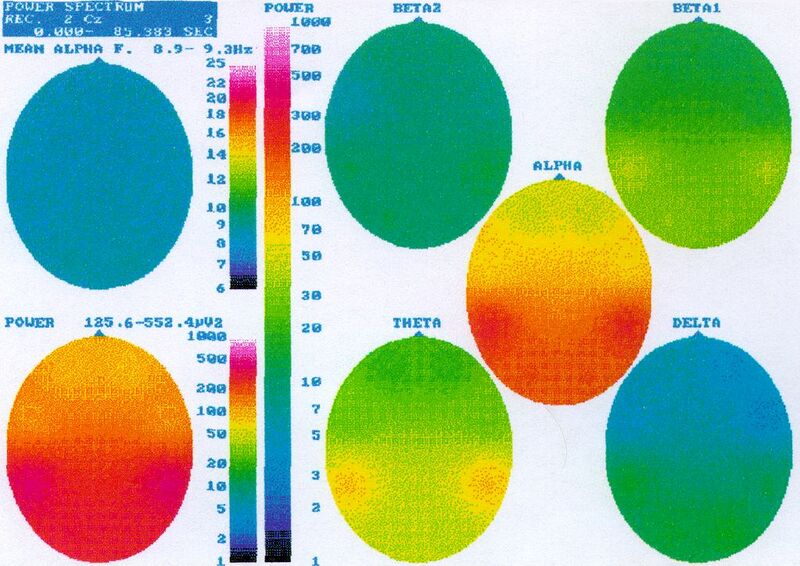 The two oval pictures to the left on the brain map display, respectively, the distribution of the mean alpha frequency and distribution of the total amplitude regardless of frequency (0,5 -36 Hz). Four examples of brain maps which show an increasing degree of contact with the subconscious. The strongly repressed person (a) has poor contact, while the meditating person (d) has the best contact with his/her subconscious. NB. These four brain maps come from various independent studies, fig. d. is from previous research done on some of the schools teachers where the measurements were taken during Kriya Yoga. Present research, however, measures the difference before and after Kriya Yoga meditation (see fig. 4.). a. Repressed – Extremely low alpha and theta indicates emotional blocking and poor contact with the subconscious. b. Normal – Moderate alpha together with some theta shows a good balance between conscious and unconscious activity with some degree of contact with the subconscious. c. Hypnosis – High theta activity during deep hypnosis shows activation of the unconscious. Low to medium alpha shows that there is little or no conscious experience of what is happening in the subconscious. d. Kriya Yoga – High theta activity during Kriya Yoga meditation shows activation of the unconscious at the same time as the very high alpha reflects a strong concentrated conscious awareness. There is optimal contact with feelings and the subconscious.